Readers from Italy have been contacting Health Impact News this past week, asking us to cover the massive demonstrations happening throughout Italy to protest a new mandatory vaccine law. This news has been censored from the U.S. corporate media. Francesca Alesse, who worked with the VAXXED film team to get the film shown in Italy last year, writes: “In an unprecedented way, the decree-law proposed by the Minister of Health has been signed by the sitting Italian president Sergio Mattarella. Only four vaccines were mandatory in Italy, now that number triples to 12. No other decree-law has moved so fast in the Italian legislative system, the reasons of such hurry are incomprehensible considering that the Istituto Superiore Di Sanità (the local version of the CDC) has declared that contrary to what stated in the decree itself there is no objective urgency. There are no epidemics, the number of cases of measles or meningitis in the current year have been substantially lower than the previous year. 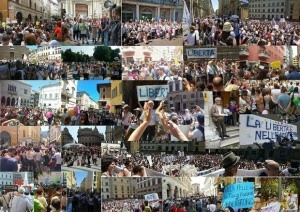 Thousands of parents have protested the new law this past June 3rd, protests and marches have taken place in 21 Italian cities spread across the nation. A national protest is scheduled for this Sunday June 11th.” The new law apparently has severe consequences for parents who fail to comply, including the possibility of having their children taken away from them. In addition to public outcry, there appears to be strong political opposition to the law as well.